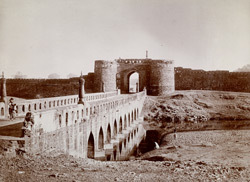 Photograph of the first Asaf Jahs Bridge near the South Gate at Ajanta, from the 'Views of the Caves of Ellora and Ajunta, Nizams Dominions, [by] Raja Deen Dayal & Sons, State Photographers', taken by Deen Dayal in the 1900s. The old town of Ajanta is situated 8 km from the south of the famous Buddhist cave temples excavated around 200 BC. The town is surrounded by a strong fortified wall and moat built by the Nizam in 1727. This view shows the bridge leading to the fort.